EOS 6D DSLR Camera (Body Only) is rated 4.7 out of 5 by 1030. Rated 5 out of 5 by Johnx50 from Nice I have been shooting for 40 years from film to the 6D. I also have a 7D and have always been impressed with the speed and ISO performance of the 7D. Its true the 6D lacks some of the controls you might expect on a full frame but it way more than makes up for it with its low light performance. It only has 11 focus point but one of them is very good and can focus in very dim conditions. Shooting in my house at night is like having a full lighting crew with me. you have to see it to believe. Some reviewers comment on no flash on this camera but it just is not required. For airplanes flying by use the 7D but for everything else give me this big beautiful fast sensor. Rated 5 out of 5 by Basilfawlty from Excellent Canon! First impressions after 1 day: Very solid camera, easy to handle. Buttons could be more precise. Lightweight compared to previous Canon DSLR but fits very good in your hand. Rubber upper wheel - very easy to work with. LCD Screen excellent. AF works very good, better than 5DII fast and precise. WiFi works fine with iPhoto on MAC (but no movies when WiFi on). GPS good but eats batteries. Only accepts Canon branded batteries. Pic quality so far EXCELLENT, especially in low light. Have only used it with L-series lenses and there AF is VERY fast. Canons superior menu system, good for both PRO:s and us other. Depth-of-field-button a bit hard to reach. Rated 5 out of 5 by Happy! from WOW! Great camera! This camera replaced my 60d. The full-frame is a fantastic upgrade for me. I enjoy the wireless feature. Was able to tether to my computer using the wireless feature of the camera (using EOS Utility + WFTPairing application that comes with the camera CD) with a bit of tumbling to find out how to set it up!!! In my opinion, the image quality is as good as 5d mark III. However, there are some stuff the 5d can do that the 6d can't do. And, a few that 6d can do, and 5d would need accessories to do!!! :) All and all, I loved my purchase and I'm very happy with it. This camera is for my everyday use. It's light and it's full-frame, and it does the job perfectly. Rated 5 out of 5 by shooter from Better Than Expected If you have decided that a full frame camera is out there somewhere with your name it. You're looking at what's available and weighing it against your budget and see the cost of full frame isn't cheap. Buy the 6d, you won't regret it. The images are fantastic! The video is, well who cares, if you want video buy a video camera. The GPS is, who cares, I'd rather have touch-screen. The WiFi is limited to phone geeks and is not going to dump your images onto your laptop. Message to Canon: I would gladly forfeit video, GPS, and WiFi for additional resources devoted to images and camera operation. Touch-screen, more cross-type focus points, dual SD slots, and stuff like that. Rated 5 out of 5 by BurninBlueSky from Making Photography Fun I bought the 6D to replace my 5D Mark III. Why you ask? 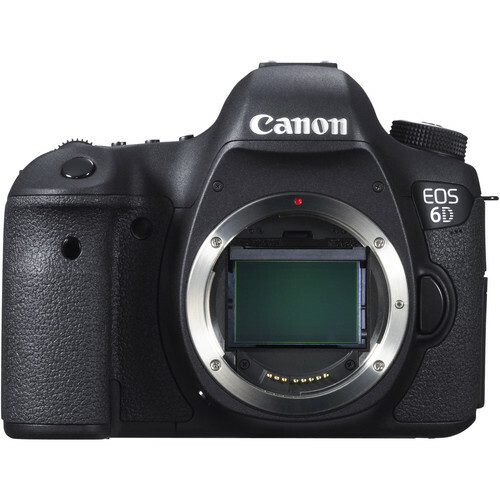 The 5D Mark III is way better than the 6D in so many ways, are you crazy!!! Well to be honest, I found the 5D a little overwelming for me, great camera. Just to many functions. After testing a fellow photographers 6D in the studio, I fell in love. The menu was easy to navigate and camera just felt right in my hands. In just a few weeks, I've taken well over 7K studio shots with outstanding results. For me, it made photography fun again. Amazing camera for the cost. Looking on the B&H site, it was not hard to find a great comb that fit my needs. Rated 4 out of 5 by Anonymous from Good deal Photography has been a hobby of mine for over 30 years. Most of my experience is with 35mms but over the past 10 years it’s been digital. My experience with Canon’s digital EOS cameras are with the Rebel XS, 20D, 60D and 6D. The 6D is a good camera. I’ve used it for plenty different shots and the only thing about this camera I wish it had was the articulating LCD. For the money you spend on this [full frame camera], to me it’s worth every penny. If you don’t care about the sensor size I’d stay with the 60D or 70D which are also nice cameras. My advice to those with average camera experience, get a decent camera but get a good lens. Does it have mirror lockup capability? Yes, the Canon 6D has mirror lockup capability. Can Sigma lenses be used on this? I don't own a Sigma lens but I think Sigma makes lenses for both Canon and Nikon cameras. So when you buy a Sigma lens for 6D just make sure the lens is Canon EF compatible. Hi!I've got a Canon Flash 320ex. May I sync it with the canon 6d without putting it in the hot shoe? I used to sync it in my canon 70d with the built-in flash light, but the canon 6d doesn't have it. I am not sure I've done my question properly, I just want to know if I can use the flash in a wireless mode.Thanks, Juan! Is this in Canadian funds? Does it support focus calibration? The Canon 6D has AF Microadjustment capability. I am looking for a camera to take a few photos but mainly for shooting videos what would be better the 80d or 6d? This is a great stills camera, but if you want good autofocus during video, the 80D has the same video quality with much better autofocus during video. can I use ef-s lenses with 6d? EF-S lenses are not compatible with full frame Canon bodies such as the 6D. Only EF mount lenses can be used with the 6D. I am going to be upgrading from my current camera to this one, and purchasing lighting for indoor studio sessions at the same time. Does this camera have a PC sync/PC terminal/X-sync socket/external flash connector/flash sync terminal? The 6D does not have a PC Sync port.